The US Dollar was dumped against the Euro on Monday ahead of a key ECB monetary policy meeting on Wednesday. German Trade Balance showed a surplus of €17.9B in February, boosting the sentiment of Euro bulls. The greenback extended its losses after the US Factory Orders fell less than market’s expectations, down for a fourth consecutive month, fueling fears of slowing economic growth. Earlier this morning, the US proposed tariffs on $11 Billion of EU products which helped the Dollar to cap its losses, at least for the short-term. Today, traders will probably continue with their bullish short-term market sentiment as we have a slow day in terms of US macroeconomic releases and nothing relevant either in the EU. 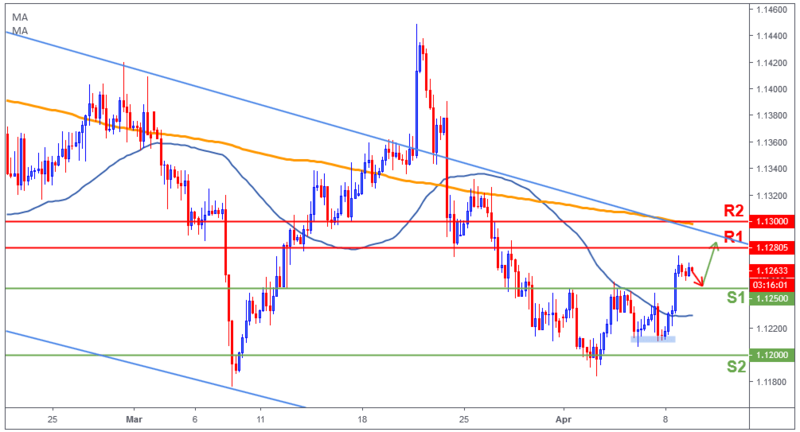 The Euro broke above the 50-day moving average (blue line) and the 1.1250 resistance level which became the new support. This recent bullish momentum could continue towards 1.1280 (R1) today as long as the single currency remains above 1.1250 (S1). However, a break below 1.1250 (S1) will confirm that the gains on the Euro were limited and the downside pressure will prevail taking price potentially towards 1.12 (S2).